Whoa…has it really been…THREE MONTHS since my last blog post? Thank goodness Google remembers my password to WordPress for me- it’s been that long, ya’ll. It’s been so long I actually forgot the 6th anniversary- November 11- of this here Tuna Toast blog! I’m a bad blog mom, seriously. 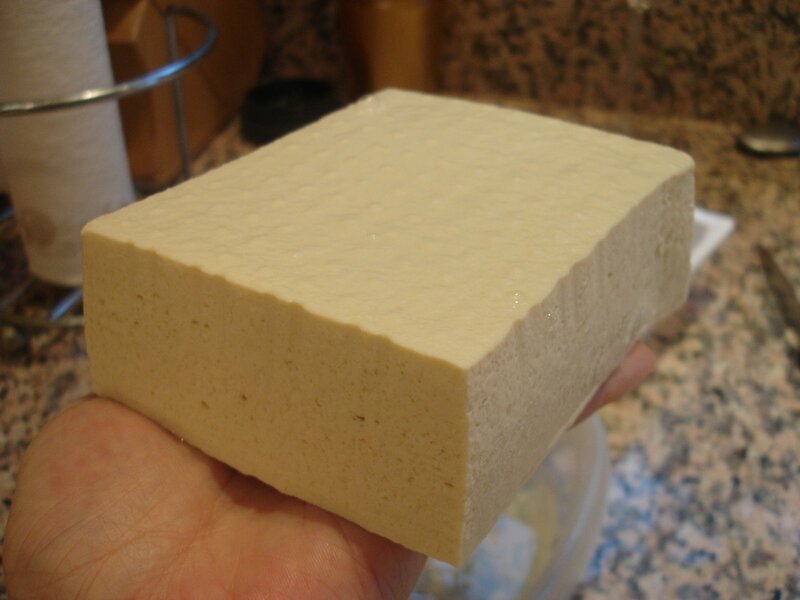 Tofu. A lot of people think of “big cube of bland whiteness” when they hear that word. I, on the other hand, grew up eating tofu and never thought negatively about it until I realized how the poor loaf has been butchered into some pretty insane and tasteless creations in order to fill some hole in the healthy food world. Although it certainly makes a good, high-protein substitute in one’s diet for chicken or fish, it doesn’t always mean tofu will be good when used in the same way that meat or fish is used. It’s got a completely different makeup, texture and flavor than any meat or fish so it should be treated like the unique ingredient it is. I have to admit, tofu does make a pretty great substitute for eggs. When mashed with a fork and sautéed with veggies, salsa and spices, the texture comes close to that of scrambled eggs. However, just because you miss a juicy burger doesn’t mean that forming mashed tofu into a patty and throwing it on a grill will make you kiss beef goodbye. Tofu is a great added to dishes that need some neutral tasting protein kick and works best, in my humble opinion, with Asian flavors. 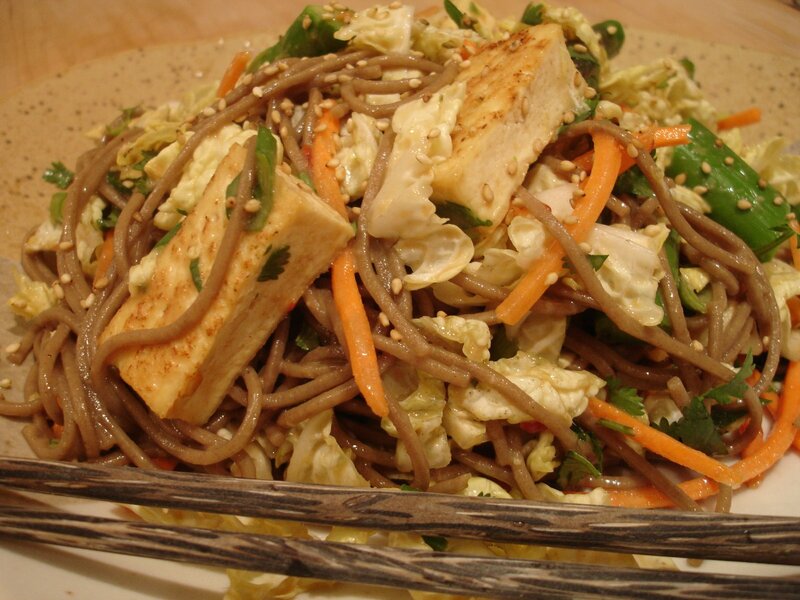 Here’s a simple recipe for a refreshing summer noodle salad that is a perfect vehicle for seared tofu. Although chicken or beef would work fine in this dish, the softer texture of tofu marries especially well with the slightly al dente-ness of the soba noodles. Whenever you’re cooking tofu, try to get the water out of it by putting it in between two thick layers of paper towels, then setting a plate on top of the top layer of paper towels. Let it sit for about 20 minutes and it will drain a lot of the water out. 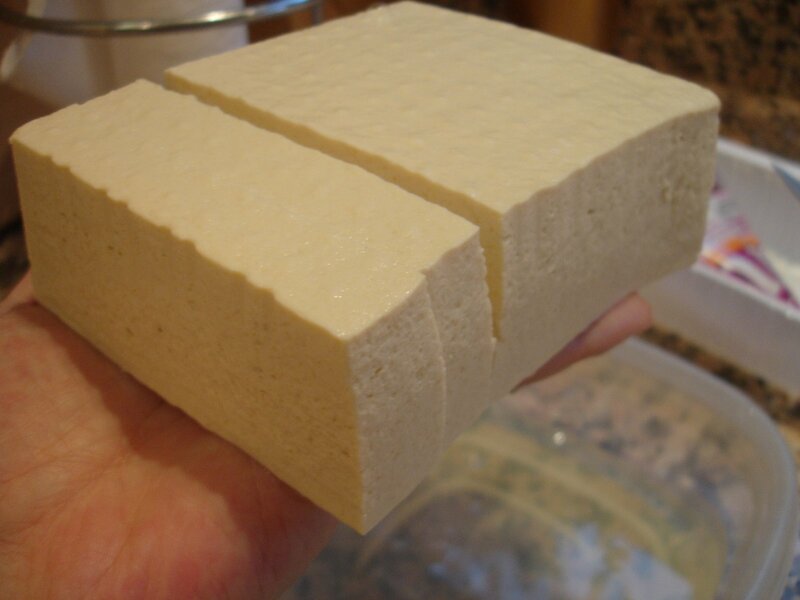 Take tofu out of the pack and drain between two thick layers of paper towels for 20 minutes. Put the tofu in your hand, and cut the tofu while holding it very carefully (so you don’t cut yourself). This is the traditional way to cut tofu- Japanese don’t put it on a cutting board because tofu is so absorbent. If you are careful you should be able to do this easily, and tofu is very soft so it doesn’t require a lot of pressure. Cut into rectangles about 2 inches long and ½ inch thick. Sear tofu for about 3 minutes on each side in a hot, non-stick skillet. Set aside. Mix all of the ingredients of the dressing in a blender or a jar- blend well. Set aside. 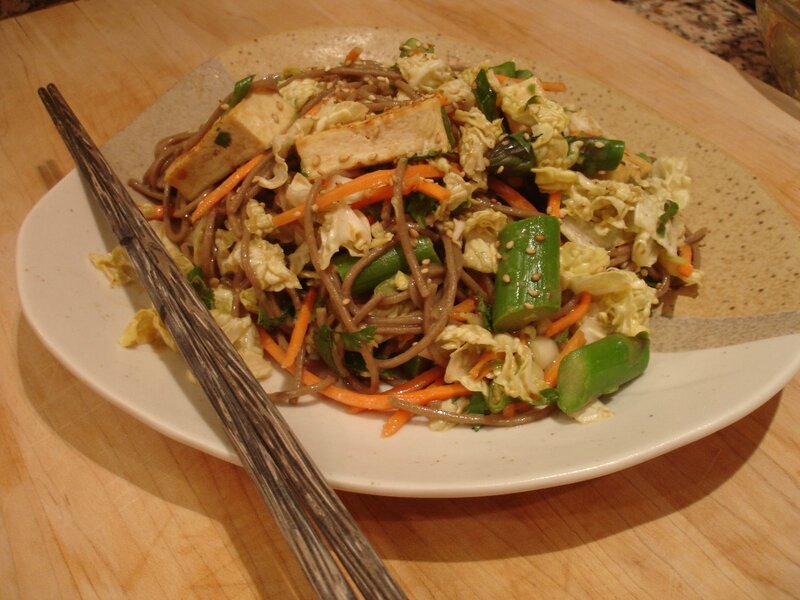 Cook the soba noodles in boiling water for 4 minutes, then remove from the heat and shock in cold water to stop the cooking process. In a large bowl combine the noodles with the vegetables and dressing, toss well, top with tofu and sesame seeds. Serve cold or room temperature. Lately, I look at the bookshelf in the kitchen just heaving with cookbooks and I feel a bit, well, guilty. 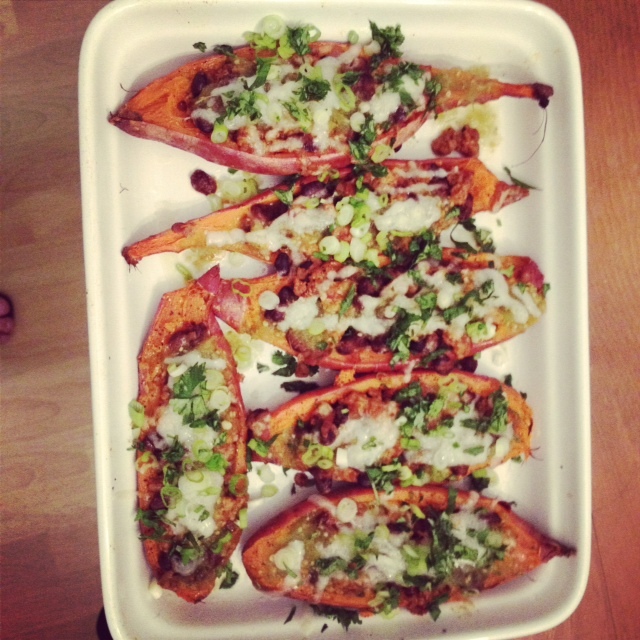 After all, up until a few short months ago I was a bona fide cookbook addict. When I wasn’t reading one of the 100 or so that I have, I’d be surfing through Amazon looking for the next fix or printing out recipes from Epicurious and stuffing it into my “homemade” cookbook – AKA The Overstuffed Folder. There was never a Sunday morning spent without one cookbook in hand while three others were piled in front of me on the coffee table, waiting for me to take a look. It was a good relationship we had, the cookbooks and I, although I might have been a little dependent. It’s odd now- I cook a lot but haven’t used a recipe in months. If I have thumbed through a cookbook recently it was merely to gain inspiration, not to follow any recipe word for word. The deciding factor in terms of what I will cook is one question- “What do I want to eat?” Seems simple, but for those of you who are recipe lovers like me, you’ll understand that sometimes the challenge and technique of a new recipe is the biggest motivator in what you make. 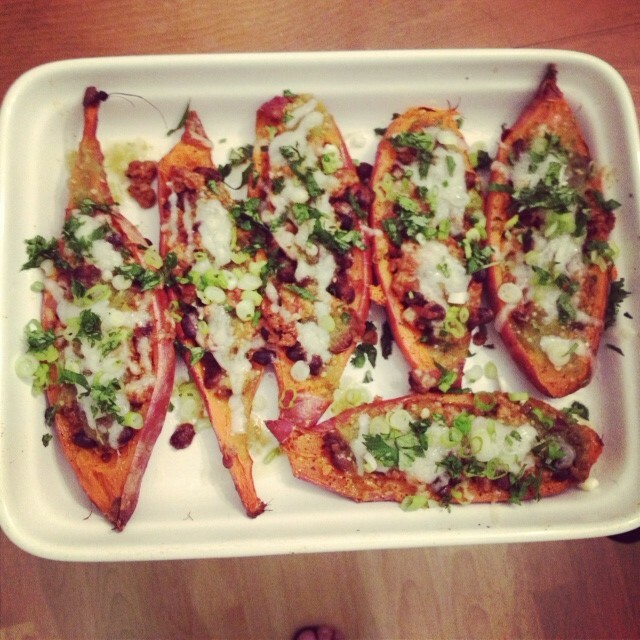 I did that for so long and believe me- it resulted in plenty of delicious and beautiful meals- but I’m in this phase of just listening to my senses, collecting all of the knowledge that is floating around in my brain and then combining it all into a dish that is exactly what I want to consume at that particular moment. Last week, after a tequila-and-wine-fueled trip to Mexico- I wanted to have a big batch of something hearty but healthy to take for lunch each day. 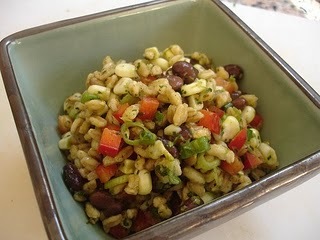 So I decided to whip up a batch farro, black bean and corn salad. Farro (type of wheat, also called emmer) has become one of my favorite grains over the last year and is great in so many dishes. It’s becoming more readily available in supermarkets but can almost always be found at any Italian market. I love the toothsome bite it retains after cooking and its slightly nutty but generally neutral flavor is very versatile. In the cooler months I like to toss it with sautéed mushrooms, thyme and baked butternut squash, but now that it’s warmer it’s the base of many great cold salads. This farro, black bean and corn salad is the perfect example of a recipe borne from what my body and taste buds were craving at the moment it was conceived, and I hope you enjoy it as much as I do. (The key to flavoring any salad using farro is to bathe the still-hot farro with whatever dressing you’re using so it really soaks up the flavors. In this instance I made a cilantro vinaigrette but you can use whatever dressing you prefer (creamy dressings probably won’t be as good) as long as you make sure you coat the farro grains while they are still warm). 1 large handful of cilantro (about 1 cup packed). Stems and all are fine. Make the vinaigrette first: With tongs, hold the jalapeno directly over the flame on your stovetop or gas grill to blacken it all over. Cut the stem off, cut in a few pieces and pop into a food processor or blender. Add all of the other vinaigrette ingredients except for olive oil and pulse until relatively smooth. While the food processor or blender is running, slowly add the olive oil in a stream until it reaches a slightly-thicker-than-salad-dressing consistency. Season with salt & pepper to taste and set aside. Bring vegetable or chicken stock to a boil, add the farro. Boil on medium heat for about 15-20 minutes- just check the consistency of a farro grain- you want it to be “al dente” so to speak. The farro probably won’t soak up all of the stock so if it doesn’t, simply drain it in a colander. Put drained farro in a large bowl and immediately toss with about ¾ of the vinaigrette. Mix well and set aside. Bring a pot of salted water to a boil and add corn. Boil for about 3 minutes, then drain and rinse under cold water until corn is cold. 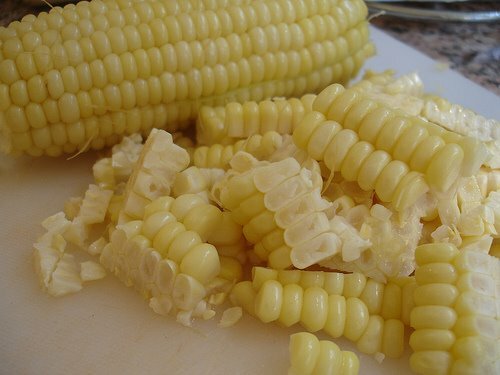 Cut the kernels off by standing one ear of corn up at a slight angle and cutting down each side of the corn. A lot of it will come of in chunks but you can crumble it up into kernels with your fingers. I like to leave a few of them chunky so it looks more homemade. Add to the bowl of farro. 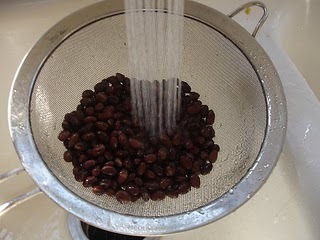 Rinse the beans in a colander under cold running water until clean, add to farro bowl. 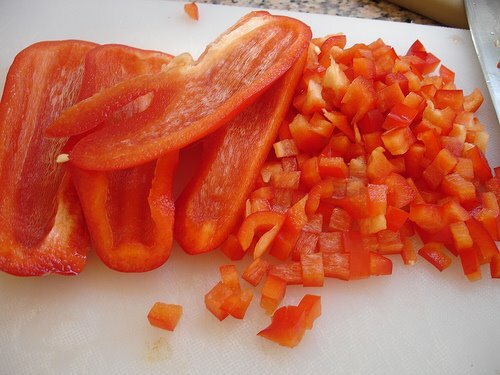 Chop the red pepper into fine dice and the green pepper crosswise into thin circles, add both to farro bowl. 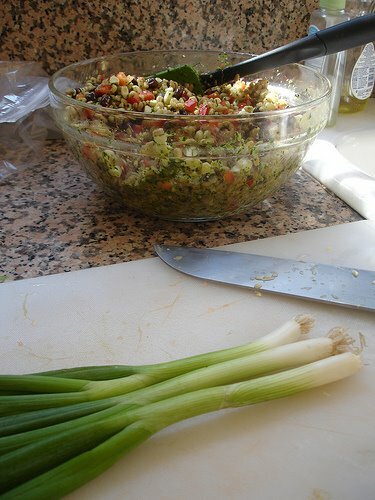 Toss in remaining vinaigrette and mix all ingredients together. Serve cold or at room temperature.